As part of the national effort to raise awareness of safe digging practices, and encourage the use of 811 to request locates of underground facilities. The Oregon Utility Notification Center (OUNC) board of directors worked with Governor Kulongoski to issue a proclamation naming April 2010 “Oregon Safe Digging Month”. In the proclamation the Governor has asked people to call 811 at least two business days before digging to insure all essential underground utilities are located before excavating. The board would like to thank the Governor for his support and hopes everyone will use the free call to 811 prior to starting any digging project. 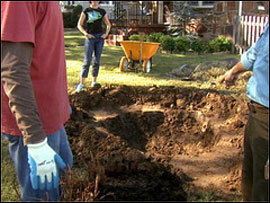 Did you know it’s the law to find out where buried pipes, wires and cables are located before you dig? I didn’t. It’s free. And if you don’t find out and then damage an underground utility line, you’ll have to pay to get it repaired. Eeek. I’d say a quick call to 811 is worth it. You can also go online to digsafelyoregon.com. Once I get started on a project, I don’t want to stop. But, you’ve got to admit, this is a small thing and you can do it anytime. The line is open 24/7. You do have to plan ahead, though. It’ll take them two days to come out and mark anything you have to avoid. We’re not talking about planting perennials or shrubs (unless they’re big), but digging a deeper hole for a tree or pond or pool or such, requires a call. Make sure any contractors or excavators you hire pick up the phone or go online. Again, no matter who does the work, you’ll be liable. The 811 call will be answered by One Call Center of Oregon and Southwest Washington located in Portland. The center will notify the appropriate local utilities that then send the necessary crews to mark the area free of charge. It’s that easy. 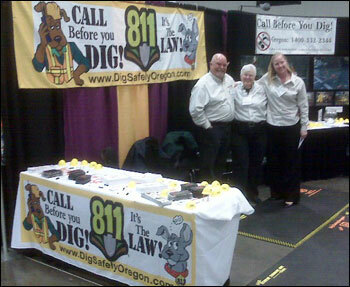 OUNC Board members Anita Floyd (Qwest), Gary Hyatt(NW Natural) and Jennifer Carter (Emery & Sons) staff the Oregon Dig Safely booth on opening day at the Portland Convention Center for the GOSH (Governor’s Occupational Safety and Health) Conference held March 10-11, 2009 in Portland, Oregon. Over 2,000 employers, safety and health professionals, safety committee members, line supervisors, manufacturers, and distributors were registered to attend this year’s conference. Conference attendees go to various seminars throughout the two day conference to gain state of the art knowledge and skills in occupational safety and health programs. The Oregon GOSH conference is considered the largest safety and health conferences in the West, and one of the largest in the United States! 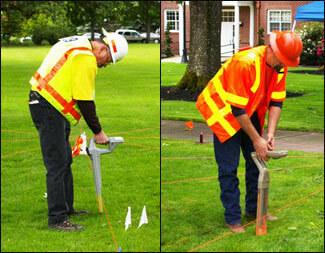 In Oregon, 29 utility locate professionals demonstrated their skills in the third annual Northwest Regional Utility Locate Rodeo held June 6-7 at Linfield College in McMinnville, Or. Participants had 12 minutes to complete a locate in one of four divisions including Gas, Electric, Water, and Communications. A bonus event, “Locate from Hell”, further challenged their skills with only three minutes to locate what could be any type of utility. The event is under the leadership of Chairperson Jamie Stencil of Comcast. Stencil and a dedicated committee supported by the Oregon Utility Notification Center (OUNC) gathered a group of 58 volunteers to make the event a success. The OUNC board decided in 2006 to host the event in Oregon to give West Coast folks a chance to experience an event that recognizes those within the locating industry for their professionalism and often demanding job. First-place winners in each division received $500 in prize money and $1300 towards their trip to the International Rodeo in Atlanta. Prizes were also awarded to second and third place locaters in each division, as well as first-place in the Locate from Hell. As part of the educational portion of the Northwest Rodeo, Paul Larkin, an instructor with Staking University in Manteno, Ill., had a packed house for his full day class on the day before the competition. “We received great feedback from everyone who attended the seminar. Paul did a great job,” Stencil said. “One city employee said that he got so much out of the class that he was going to sign up his entire department next year.” Stencil and Kimberly Lakey, administrative assistant at OUNC, noted that all participants and volunteers had positive comments about the event. “They noted that it was well organized and smooth running, but very challenging,” Stencil said. Stencil also praised his committee members for their dedication and hard work. “As the event grew closer, I didn’t feel the pressure that I had felt in the years past because of all the hard work of the committee members. They took on a huge work load for the event on top of their existing jobs,” he said. Plans are underway for the 2009 event!!!!!!! Think about what you do when you’re sitting in bumper-to-bumper traffic waiting for the light to change. Chances are you spend at least a little of that time checking out the stickers plastered on the vehicle in front of you. In fact, Jarrod Morrison of Contract Construction & Program Management for PGE is counting on that. 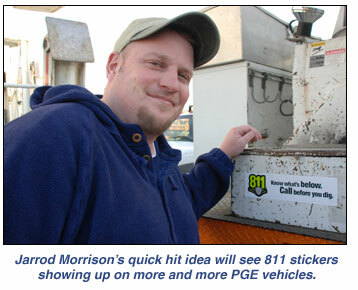 As Morrison explains, with the help of Fleet Services, his goal is to get an “811 — Call before you dig” sticker placed on the bumpers of all PGE vehicles, everything from line trucks to company vans. His plan — conceived as a Customer Focus Initiative quick hit — calls for stickers to be placed on each vehicle as it makes its way through Fleet Services for maintenance. “We’re always looking for new and different ways to get the ‘call before you dig’ message out to people,” Morrison says. “Nationwide, about half of the damage done to underground utilities occurs because people do not call and ask for a locate.” A locate is when a professional utility locator visits a site in advance of any digging and marks the approximate location of an underground utility line. 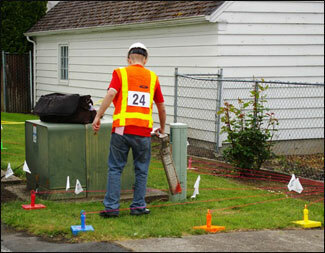 In 2007, PGE received 339 reports of so-called dig-ins, which occur when someone hits one of our underground lines. In 2006 the Federal Communication Commission set aside the three digit number 811 for calling before you dig and it became the nationwide number to call for locates on May 1, 2007. The Oregon Utility Notification Center, (OUNC) the state agency responsible for the Oregon excavation law and the administration of the One Call Center is committed to preventing damage to underground utilities. 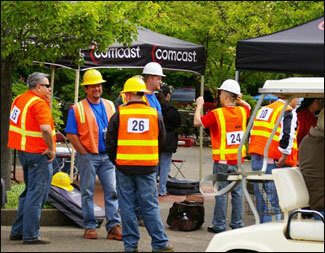 So, It has joined forces with the Common Ground Alliance, (CGA) a national damage prevention organization and its 1,400 members to participate in its national “Call before you dig” campaign to increase public awareness about the importance of having utility lines marked before digging.